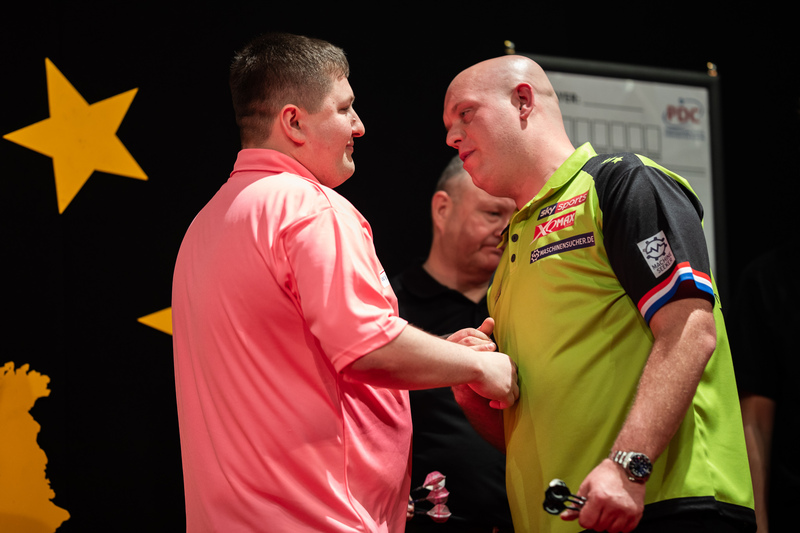 KEEGAN BROWN claimed an incredible victory over world number one Michael van Gerwen in the second round of the German Darts Championship on Saturday, defying a 108 average to progress to the final day of action at Halle 39 in Hildesheim. Brown produced a perfect display of doubling to complete a stunning 6-4 success against World Champion Van Gerwen, who was one of just three seeded players to lose their opening match. The first eight legs were shared before Brown, who averaged 104.12, took out finishes of 88 and 92 to knock out the number one seed. Brown will meet James Wilson in the third round after the Yorkshireman survived a match dart in his 6-5 win over Mario Robbe. Ricky Evans won five of the last six legs to dump fifth seed Mensur Suljovic out of the tournament, producing a crucial 124 checkout on the way to a 6-4 success. Dave Chisnall was the third seeded casualty as he lost 6-3 to Mervyn King, who will face Evans in the last 16. King raced into a 4-0 lead, averaging 109, and eventually got over the line after Chisnall missed crucial darts at doubles in a nervy end to the match. Former World Champion Rob Cross, who reached the final of the European Darts Open last weekend, defeated Ron Meulenkamp 6-4 to progress. Cross will face Daryl Gurney in the last 16 on Sunday after the Players Championship Finals winner eased past Andy Boulton, reeling off five consecutive legs for a 6-1 success. Ian White claimed a 6-5 victory in a superb contest with Jamie Hughes, who landed six 180s and averaged over 107 only to miss out agonisingly. Hughes landed an early ten-darter as he claimed a 3-1 lead, only for White to move 4-3 and 5-4 up. The Stoke ace wired the bull for a 164 finish in leg ten and then missed two further darts for the match as Hughes levelled, and both players landed 180s in the decider before White completed a 12-darter to win. Joe Cullen defeated Nathan Aspinall in another high quality encounter. Both players averaged over 101 with Cullen triumphing 6-4 over the UK Open champion. Adrian Lewis will meet Cullen on Sunday afternoon after the two-time World Champion proved too strong for German debutant Kevin Knopf, coming from a leg down to prevail 6-3. World number three Peter Wright enjoyed a 6-3 victory over Andrew Gilding, taking out 110 to complete his opening win. Wright will play Jermaine Wattimena in the last 16 after the Dutchman stormed through six successive legs for a 6-1 triumph against home favourite Steffen Siepmann. Stephen Bunting came back from 4-2 behind to defeat Dimitri Van den Bergh 6-5, setting up a third round encounter with number two seed White. After losing three consecutive legs, Van den Bergh took out a brilliant 160 finish to force a last-leg decider but Bunting pinned double 16 to edge through. Darren Webster survived a missed match dart from Luke Humphries as he claimed a narrow 6-5 victory in a thrilling opening to Saturday's afternoon session. The pair then traded 180s in the deciding leg, with Humphries being first to a finish only to miss double 16 as Webster stepped in to take out 62 on tops for the win. James Wade opened his bid for a third European Tour victory with a 6-1 win over Boris Koltsov, taking out 142 as he opened up a 3-0 lead before closing out a clinical win to set up a meeting with Webster. Jonny Clayton, the 2018 Austrian Darts Open winner, was in fine form as he overcame Simon Stevenson, finishing 140 on his way to a 4-0 lead and holding off a mini-revival from the Plymouth thrower before sealing victory with six doubles from 11 attempts. The German Darts Championship concludes on Sunday across two sessions, with streaming available for all PDCTV-HD Subscribers worldwide as well as through a series of bookmakers' websites listed below. PDC European Tour events can be watched online through PDCTV-HD for all subscribers worldwide.